Abert's or Tassel-eared Squirrels (Sciurus aberti) are large, tassel-eared tree squirrels found in Ponderosa Pine (Pinus ponderosa) forests in parts of Arizona, New Mexico, Colorado, and Utah. 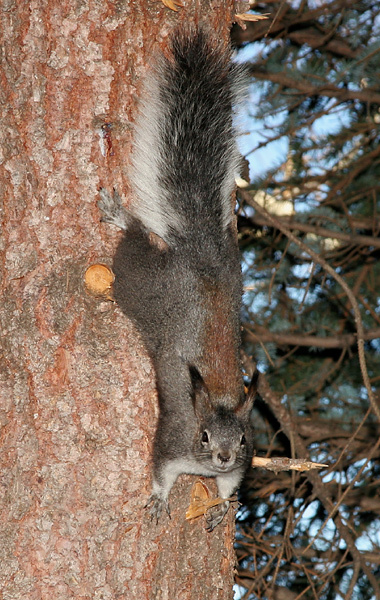 Abert's Squirrels are strongly associated with Ponderosa Pines because these squirrels depend on them for both food (pine seeds, inner bark, buds) and shelter. Here in Arizona, Abert's Squirrels are found in the north-central part of the state in places like Flagstaff and the rim of the Grand Canyon. 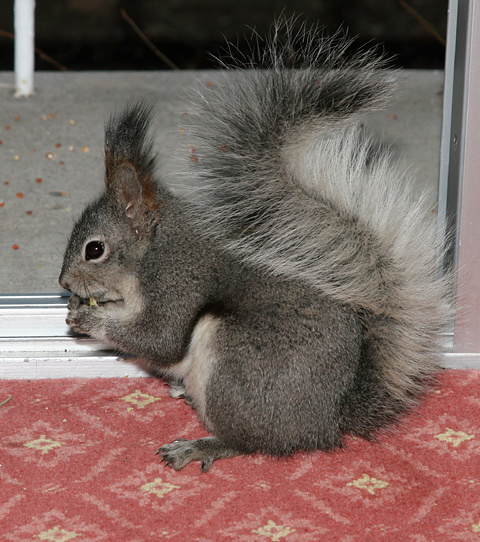 In March of 2008, this particular Abert's Squirrel, a cheeky, tourist-loving beggar, walked right into our Flagstaff, Arizona hotel room seeking handouts. The Abert's Squirrel was not only demanding, it was also picky, preferring our cheese crackers over the bird seed that we had tossed outside for the birds. Abert's Squirrels are grizzled gray above and white below with a streak of reddish brown down their back, a large, fluffy, gray and white tail, and distinctive, long, black ear tufts that make them very easy to identify. An unusual-looking subspecies of Abert's Squirrel, the Kaibab Squirrel (S. aberti kaibabensis) with black undersides and a mostly white tail is found on the north rim of Arizona's Grand Canyon. 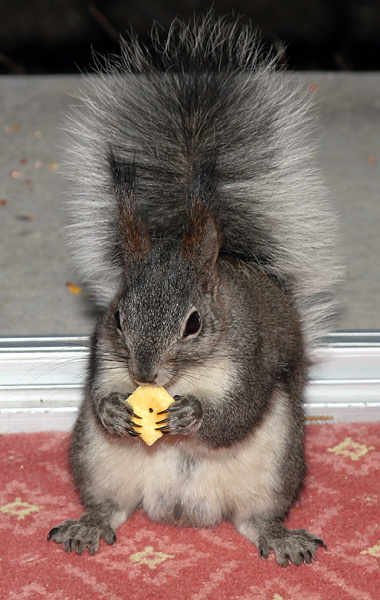 Unlike the north rim Abert's Squirrels, those found on the south rim look like this one from Flagstaff. The Grand Canyon has acted as a genetic barrier between these two Abert's Squirrel populations, preventing interbreeding and allowing the unusual-looking Kaibab Squirrel subspecies to develop.